I want to revisit a fascinating study that recently came from (mainly) the Geophysical Fluid Dynamics Lab in Princeton. It looks at the response of the Atlantic Ocean circulation to global warming, in the highest model resolution that I have seen so far. That is in the CM2.6 coupled climate model, with 0.1° x 0.1° degrees ocean resolution, roughly 10km x 10km. Here is a really cool animation. When this model is run with a standard, idealised global warming scenario you get the following result for global sea surface temperature changes. Fig. 1. Sea surface temperature change after doubling of atmospheric CO2 concentration in a scenario where CO2 increases by 1% every year. From Saba et al. 2016. 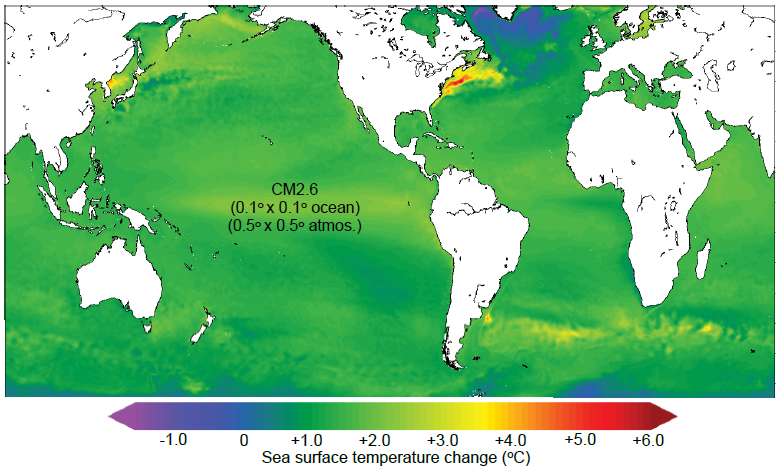 Most of the oceans got moderately warmer (green). The subpolar Atlantic got colder (blue). That’s the familiar response to a slowdown of the Gulf Stream System or AMOC (Atlantic Meridional Overturning Circulation), and that is also what the present paper attributes this to. Such a cooling of the subpolar Atlantic since the beginning of the 20th Century is actually observed, as we have discussed here. 2004 to 2013, we ended up warming faster than really any other marine ecosystem has ever experienced over a 10 year period. That is just the time interval during which the RAPID project (which went into the water in 2004) measured a slowdown of the AMOC by about 3 Sv, or 20%. The following image shows a close-up from the CM2.6 model run. Fig. 2. Bottom temperature change in the Northwest Atlantic Ocean and Continental Shelf, in the same model run as in Fig. 1. From Saba et al. 2016. Both observations and the climate model demonstrate a robust relationship between a weakening Atlantic Meridional Overturning Circulation (AMOC) and an increase in the proportion of Warm-Temperate Slope Water entering the Northwest Atlantic Shelf. Now we are extremely lucky to have proxy data exactly from this area, see Fig. 3. Fig. 3. Map of the Northwest Atlantic with the Gulf of Maine and the Northeast Channel. The rectangle shows the area from which deep-sea coral proxy data are presented in Sherwood et al. 2011. To cut a complicated detective story short: Sherwood et al. 2011 are able to use nitrogen-15 isotope data to analyse the water mass in which the corals grew. They have a continuous record from 1926-2001, as well as some finds of older corals. Their data look like this. Fig. 4. Nitrogen-15 record from Northeast Channel corals. From Sherwood et al. (2011). The less nitrogen-15 in the corals, the more warm slope water from the Gulf Stream and the less Labrador Sea Water were present in the mix of the sea water at the time they grew. As it happens, the coral proxy measures just the change in water masses that Saba et al. find in their model experiments! Coral δ15N is correlated with increasing presence of subtropical versus subpolar slope waters over the twentieth century. The persistence of the warm, nutrient-rich regime since the early 1970s is largely unique in the context of the last approximately 1,800 yr.
That finding is consistent with Rahmstorf et al. (2015), where we came to a very similar conclusion about the AMOC weakness after 1970 based on a totally different approach, namely using a proxy-based temperature reconstruction for the subpolar Atlantic. Our basic assumption was that weak AMOC implies a cold subpolar Atlantic, relative to the average northern hemisphere temperature. We thus used the blue region from Fig. 1 as AMOC indicator. Fig. 5. Sherwood’s coral data (green, scale on right) and the temperature-based AMOC index using NASA GISS data in red and HadCRUT4 data in blue (scale on left). From Rahmstorf et al. 2015. Here we thus have some pieces of the AMOC puzzle that fit beautifully together. They suggest a weakening of the AMOC by about 15-20 % over the 20th Century, superimposed by some decadal variability. A weak AMOC is found around 1980-1990. After that it recovers somewhat into the early 2000s, as suggested by both the coral data and our AMOC index. Then it declines again, as confirmed by the RAPID data. For the future, we have every reason to expect that both things will continue: the long-term weakening trend due to global warming, and short-term natural variability. When both work in the opposite direction, the AMOC will strengthen again for a while. When both work in the same direction, record cold in the subpolar Atlantic may result, like last year. Ever since I was a kid (1950’s) the ocean water in Maine has been so cold in the summer that only the very hearty would brave swimming in it. About one week each summer it would warm up to bearable (usually following a storm that brought warmer water up from the south. A question that comes to mind is whether you need ocean dynamics at all to reproduce the east coast warming in a sufficiently high resolution simulation? Or, whether you might expect such a pattern to emerge in a slab ocean setup under idealized conditions? I have in mind the paper from Yohai Kaspi and Tapio Schneider discussing how imposed heat-flux convergence (in e.g., the North Atlantic sector) leads to upstream cooling just from Rossby wave dynamics. Forgive me if I’m misunderstanding this, but isn’t this a remarkably powerful example of the predictive power of climate models? We hear the constant whine about models, but here is an extremely localised (in global terms) and not particularly intuitive result from models which in line with observational data. That’s a remarkably powerful story about the power of climate models. I think. Is this change enough to eventually destabilize the clathrates along the East Cost? But they don’t seem to mention the role of AMOC weakening; it would seem that it would have a large effect if there is less oxygenated surface water being injected into the deep ocean’s conveyor belt. Interesting. Had certainly noticed what some had called the “anti-blob” of cooler SSTs in the North Atlantic… but is the impact of meltwater from Greenland also a factor? If that’s put into the models do SSTs get even colder? Already been studies showing this very thing happening off NC coast. Clathrate destabilization not a popular topic in some circles, but increasingly likely (especially later this century) as as ocean warming along most continental margins. I suspect this issue, like Antarctic and Greenland melt rates and contribution to SL rise, will provide ample material for future research. I see some signs of blue stuff heading east. Does this suggest impact on Gulf Stream and can UK along with those other folk in Western Europe expect colder climate? In fact, in this winter and spring 2015 to 2016, the UK and Ireland have experienced very mi8ld temps until about end January, then unseasonably chill and dull weather through Feb to May, while the rest of the world apparently basks in an El Nino induced warmer year than in recorded history. And go into Arctic Sea Ice and you will see that things look tyo be heading to a record year of melting and diminution of the Arctic Ice cover. What is happening? 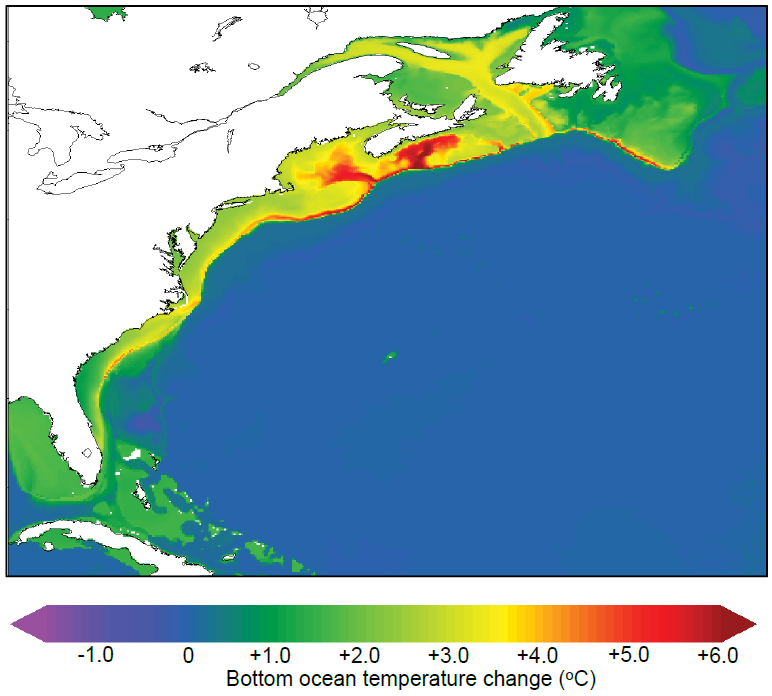 Is it trerlated to the blob of exceptionally warm water up the East coast of N America? Is tyhat contributing to the melting of the sea ice to the north of the Atlantic? Has it been a factor in the genesis of cyclones moving over to Ireland/Britain bringing dull cloudy wet weather with them? Is the constant blast of cold air mazses fromn the north coming to Brit/Ireland the result of air that has cooled over the Arctic, loosing heat having transferred heat energy to the ice and melting it? 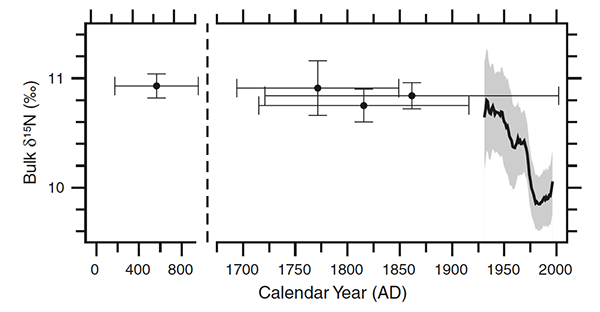 Do paleo proxies tell us the rate of change for this sort of event in the past, vs. the present rate? The ocean temperature near Boston has been cool this Spring. Interesting those hot spots don’t travel inward. Very pleasant compared to Princeton, which tends hot. Increasingly looking like a good place to take shelter as heat increases. I have been wondering for over a decade about the AMOC and freshwater melt, so am grateful for this. The biggest concern for increasing temperatures offshore NE and Gulf Of Maine will be fisheries. Cod won’t recover even with protections and the other major fisheries will be altered radically as well. The biggest problems in the short term, that is. The East Coast has been seeing heavier snow and probably rain and that’s going to continue. Melting in Greenland has a big component in it that’s unrelated to the ocean temperature – the increase in forest fires to the West so that’s likely to increase. I am still interested in shellfish farming and seaweeds off the West Coast so it’s nice to see there’s only minor change, however, the shellfish farmers in Washington and some in Oregon started to have major problems with acidification over twelve years ago. That’s going to get worse. It’s threatening the Dungeness Crab fisheries as well. Hi Susan, nice to see your comments on the NYT. It’s gotten too shrill for me lately (I use a pseudonym there anyway) plus I’m studying GIS so this map is very interesting. Their use of small area-resolution of 10 M by 10 M is exceptional on these scales. It explains what’s going on with the ocean and with the research itself. It explains the mechanisms at work in ocean oxygenation and deoxygenation attributable to climate change. It gives the de-ox map graphic full size, so you already have a head start on understanding the process, right there. 5. Silk wrote: “not particularly intuitive result”. In my case – that may be an understatement… Why would a weakened Gulf Stream shift north? I have thought of the two currents pushing against each other – the Gulf Stream north, the Labrador Current south. With the Gulf Stream weakening, and the Labrador current perhaps strengthening due to the Greenland and Arctic melt, shouldn’t we expect the boundary between these two shift south, not north? 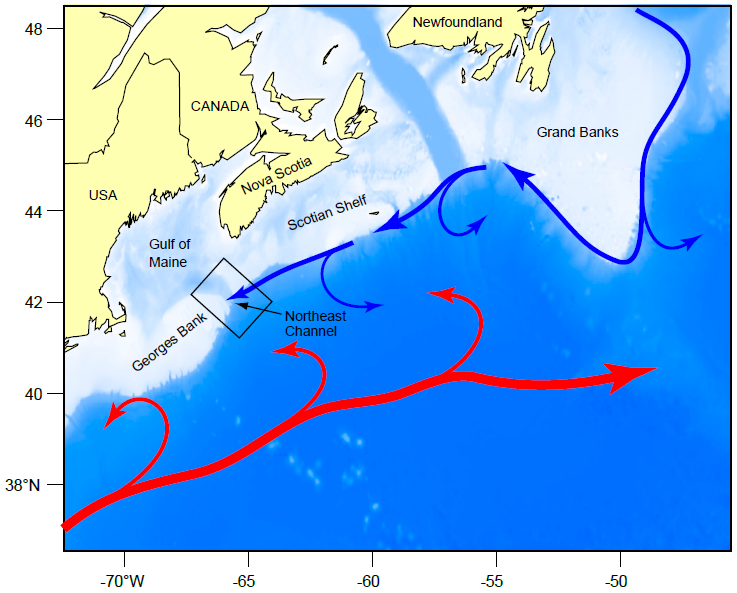 The warmer Gulf Stream water shifts “north” in that specific location — south of Newfoundland and the Grand Banks — shown in the several charts. Might well say it shifts west, actually. It’s a local change, not the wholesale rearrangement others have talked about where the area of sinking cold water gets more dilute and moves southward in the Atlantic. Could you [Stefan] make 2 or more maps of that flow [fig 3] please? Show us the move north? That ocean oxygen decreasing scares me because our extinction at 6 degrees C is by H2S coming out of oceans that have no oxygen. Are you sure about this? People around Black Sea live despite all the deeper waters of that sea being anoxic and producing H2S. Also – it would take some time to draw the global ocean into the anoxic regime – you would need a lot of dead organic matter to sink in, yet the same processes that would lead to lower oxygen supply to the deep ocean (shut down of thermohaline circulation + reducing mixing across the main thermocline) would also reduce supply of nutrients to the surface layer where all the new organic matter is formed. We add some nutrients via rivers and air – but is it enough? I assume it isn’t meant to be Sieverts, so what in a climatological sense is an Sv? I don’t think anything predictable happens the moment 6C is cracked but that might be an indicator for a moment of no return and where the climate then heads rapidly towards. CO2 won’t kill anyone imo. What it subsequently causes, if let loose, most definitely will. re: Thomas 21 – My point was about time scales – that it would probably take considerable time for the deep ocean to go anoxic other than locally (large volume + reduced oxygen consumption in the deep ocean as a result of reduced nutrient supply). The presenter in your video points that in the next 1000 yrs it is the sealevel rise that we have to worry about. 22 Piotr, maybe look at the whole lecture and keep things in perspective. That and read the papers that underpin that talk, especially those about H2S – you didn’t mention time scales before, which is why I specifically addressed that in my heads up post. Did you notice the death warning signs on the edge of the black sea in that as well? You’re also misreporting/verballing P ward about the 1000 years SLR – it’s all interconnected and heading in one direction. You’re skipping over his #1 POINT in saving the continental ice sheets. He was talking about now, action now, not 1000 years from now. Timescales are irrelevant when it comes to action, or looming issues as a result of agw/cc …. lose the arctic ice leads to losing the ice sheets, lose the ice sheets and anoxic seas and then whole oceans is a direct result followed by H2S and geologic extinctions of life for millions of years. The lecture title was “how bad could it get” – how long do we have wasn’t an option up for discussion. As I said have another look, watch it all, pay close attention to the refs and look at google scholar, pause and replay the difficult bits. 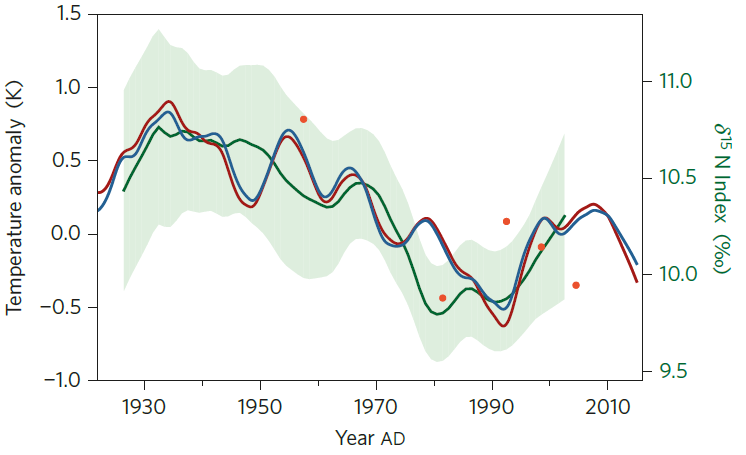 Yet another article (this one in Nature Geoscience) suggesting a slowdown in the AMOC. The article suggests the slowdown is not related to Climate Change but rather is a return to a previous state following an increase in the rate of overturning. I thought I did. In fact, other than the first two lines, my whole original comment was about the time scale – starting with “it would take some time to draw the global ocean into the anoxic regime” and then explaining why. And after that you accuse me of “misreporting” and/or “verballing” (=”The putting of damaging remarks into the mouths of suspects during police interrogation”) ??? “watch it all, pay close attention to the refs and look at google scholar, pause and replay the difficult bits.” ? Are you being serious? You call that a “time scale”? OK then, fine. ‘patronizing’ is a personal value judgement, not a fact. If you parsed what Ward was saying one needed to worry about you’d already know that SLR 1000 years hence wasn’t it. It’s not my fault you’re wrong. Seriously, it isn’t. But believe whatever you wish. Thomas 27: “Are you being serious? You call that a “time scale”? Yes, I am serious, and yes – since I had implied that something would take long time to materialize (and might therefore be subject to processes acting at such a long time-scale) – then yes – this is relevant to the “time scale”. Thomas: ‘patronizing’ is a personal value judgement, not a fact. Now everybody can decide for themselves whether these are condescending or not. The proof is in the pudding. I imagined I was clear the first time and reflected precisely what Ward wanted to convey to his audience ie showing what the crux of the problem is and why it is so – Ban the Burning of Coal and other fossil fuels now, today, yesterday! Why anyone would take issue at what I had said is a mystery to me. Seems so self-evident and obvious to me by watching the video. Oh well. Ours is not to reason why …. Thomas: Seriously this is ridiculous. Believe whatever you wish but you are 100% wrong. I know that is absolutely correct. dismiss testing claims using facts (quotes) and logic as a subjective … belief (“Believe whatever you wish”), and instead a proof for your claims you offer your assurances that you “know that it is absolutely correct”. “You are 100% wrong. I know that is absolutely correct”. #30–Thomas, don’t mean to offend, nor to become involved in your discussion with piotr; but had the comment about ‘taking time with the difficult bits’ been directed to me, I certainly would have felt patronized, too. Climate science is so fascinating. Take for example the recent discussions regarding the melting of the Greenland ice cap and how it may be affecting the AMOC, a major part of which is the gulf stream. We’ve all heard that Northern Europe’s climate is milder than one would expect for that latitude on account of the gulf stream bringing warmer equatorial waters into the North Atlantic. And many of us know that the AMOC is a major modulator of the climate of the entire globe because it transfers so much energy south to north and north to south. What’s been particularly interest-piquing lately are the color-coded maps showing how the earth has been warming up over time. They show colors ranging from yellow to red for areas that are warming, and light blue to darker blue for areas that are cooling (there are very few such areas these days). The maps show very clearly that almost the whole of the earth is warming, especially the north polar regions where a phenomenon known as polar amplification appears to have taken hold. But fascinatingly there is a blue patch just to the south of Greenland, indicating that in that one spot temperatures have actually declined over time. What is so interesting is the fact that much of the gulf stream goes right through that patch of blue. One is compelled to ask: could that cool patch be affecting the gulf stream? In browsing the scientific sources on line one finds things that are quite stimulating to the mind. For example, how many of us know that there is a unit of measurement called a “Sverdrup”? Such unit (Sv) is equal to one million cubic meters of water per second. The outflow of the Amazon is 0.2 Sv (one fifth of a Sverdrup). The flow of the AMOC is 15 Sv, or 75 times the outflow of the Amazon. Pretty cool, huh? Of great interest is the observation, according to recent measurements of the AMOC, that its flow has decreased by around 20%, or 3 Sv, or the equivalent of 15 Amazon outflows. It appears that such decrease may be attributable to the patch of colder-than-normal water, the “blue blob”, south of Greenland. There is also a suspicion that such slowdown may be affecting the climate of Northern Europe. So this brings us to the big question: what is it that might be causing the blue blob and the slowing of the AMOC? Could it be the melting of the Greenland ice sheet and the decreasing mass of the north polar ice cap? Apparently fresh water holds less warmth than salt water, and thus brings relative cooling to the part of the ocean where it dominates. Could the slowing of the AMOC worsen as climate feedbacks occur and ice-melt quickens? If one follows the news one has heard that the polar ice cap in the north is well into a major decline, and the Greenland ice sheet is suffering extensive mass loss. Could these be contributing to the blue blob, contributing to the disruption of the AMOC? Will these get worse? So far no scientist seems to be willing to go out on a limb and publish a paper asserting a direct causal relationship between the growth in fresh and colder water south of Greenland and the slow-down of the AMOC; or predicting worsening climactic conditions for Northern Europe. But isn’t it interesting? It certainly keeps one sitting on the edge of one’s seat to see what may develop next. The fascination grows even greater when the science is considered in the context of world events: increasingly destructive rainfall and other storm events, rising sea levels, climate refugees, powerful fossil fuel companies pulling strings, atmospheric carbon still increasing, oceans acidifying, coral ecosystems perishing, political and economic turmoil. Stay tuned. Thomas, you’ve conflated two different things under the category “problem” then made an argument out of what’s the bigger problem. The other: the feedbacks (all the consequences). Ward is lecturing on the consequences. You’re banging on “problem” — burning fossil fuel — as though anyone disagreed that’s the problem. Everyone understands that forcing this change on the climate has been a problem. Fossil fuel is not the point of the lecture — everyone understands the forcing. Ward addresses what the scientists are studying — the consequences. 33 Kevin McKinney, nothing like that was intended. Suggesting that someone may have missed something and to follow through with a suggestion to check out the referenced papers and other scientists mentioned about the topic and view the entire lecture holistically (which is what I meant) is hardly patronizing. That happened here 24/7 across the last decade. How about simply focusing on the actual science and import being presented in the video lecture which I have been instead of “feelings”? But either way, it’s a false dichotomy. And you do know what they say about intentions, right? GO hassle Piotr or Greisch about their misunderstandings and unsciency grammar http://www.realclimate.org/index.php/archives/2016/05/amoc-slowdown-connecting-the-dots/#comment-652996it and Piotr’s non-scientific meaningless statement it “would take some time” they claimed meant a “timescale”. Please go find someone else to argue about arguing over nothing. Your understandings of what I or others say is your responsibility, not mine. I have explained and clarified quite enough. You go deal with that, because I’m not interested in playing word games. Your description is more or less what I thought too, but I’ve seen comments by scientists that make me doubtful. You need a real live climate scientist to comment. When catastrophe is imminent, sit back and enjoy the show! Then I’ll explain that too Kevin. They are in quotes because they are false feelings based solely on incorrect assumptions and a misreading of my words and my intentions. iow they are not valid feelings given the reality. Yes I do. What are your intentions on continuing with this kind of ridicule? You do know what they say about “to assume” Kevin?